C.N. Bring writes in the military suspense genre and has stuck to her own style of writing despite pressure from traditional publishers. Learn why she’s skeptical of Facebook as a marketing tool and why word of mouth is so important to promoting your book. 1. Give me the elevator pitch for your book in five to ten sentences. Commander Celia Kelly is a perceptive Naval intelligence officer rebuilding her life after the tragic death of her husband. The suspicious suicide of a fellow officer has Celia questioning the mission she’s been assigned. With the help of a one of a kind secretary, a by-the-book assistant, and a Navy SEAL, Kelly discovers she’s been set up. Digging relentlessly, nothing is as it seems. Someone is after twenty million dollars that disappeared when Kelly’s husband died and now that someone is after her. I was almost published traditionally, but I was asked to change the story too much. The series is not a romance, but instead a military mystery, suspense. The traditional publisher wanted to add a formula romance to the story. Though I wasn’t opposed to changes that might enhance the story, I was against losing my original audience. Truthfully, romance isn’t really my thing. To be successful, we all have to find our own voice unlike anyone else’s. The hardest part about the business is they (publishers) want a safe sell. They want a familiar story with a new voice. It’s the publishing catch-22. So I started to explore indie publishing. It’s had its ups and downs. The first company I chose was a bad experience. So I started all over again. I then chose Xlibris. It was a much better experience. The thing I like most about the process is I can have the final say in everything. The hardest part is a toss up between finding a good editor and the dreaded marketing. I use Facebook, Twitter, LinkedIn, and my own website. 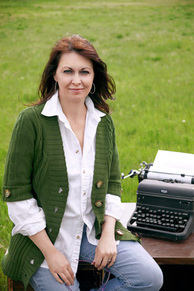 I am a member of Military Writers Society of America and the Women National Book Association. I also do book signings and attend events like fairs. Twitter and LinkedIn have given me a few connections. A website is very important, because if you don’t have a book on you, you want to be able to hand them a card with your site on it. The most effective marketing tool is word of mouth; getting a buzz going. It starts with these social media tools, but ultimately, it is getting readers to talk about your book with everyone they know and so on. 5. Are there any marketing techniques you intentionally avoided or discontinued? Why? I’m on the fence about Facebook. It seems like a lot of followers without much result. It is more of a social site and not a business site. That being said, it is still another way to get your book and name out there, even if it isn’t necessarily resulting in direct sales. Beware of marketing schemes within self-publishing companies. Paying $500 for e-mailers will do a lot less than just buying $500 of your books and putting them in the hands of readers. Word of mouth has sold more books for me than publishers’ marketing options. You do your own commercial on TV or add in newspapers with $1000 while a self-publisher might charge $1000 promising to get your book read by Hollywood. Either research everything presented to you very carefully or hire a marking company (if you can afford it). Take the time to make every penny count and try not to get caught up in something that sounds amazing. It is probably a big waste of money and time. Find a person who can be a solid sounding board and isn’t going to feed your ego. At the end of the day it’s learning to make good business decisions, which sounds easier than it is. 6. Which services or vendors do you recommend for marketing methods you’ve used? My publisher provides business cards, bookmarks and posters that I use often. The posters I send out ahead of time before I do a book signing. Don’t forget to list your website and blog on everything. Since I write military mysteries, I dedicate my blog to the real men and women who serve our country. It has proved to be very rewarding. I’ve met a lot of truly amazing heroes along the way! I also provide a military discount. 7. What’s the most important thing you’ve learned about self-publishing you didn’t know when you started out? Pay attention to the edits! The final product falls on you! That can be difficult for those who are creators but not editors by trade. 8. If you could do one thing different about publishing your books, what would it be? Nothing. I think there is always a reason for the paths we choose and if we had done anything any differently, we wouldn’t be where we are or learn what we need to know. Life shouldn’t be about regrets. It’s about learning from our mistakes and being better for it. Some have a long journey and some a shorter one. There is no wrong path. It is what it is. I would have to reiterate the power of social media and word of mouth marketing. More importantly, don’t kick yourself when you’re down (sometimes you will be). It can be very difficult at times, but find the lesson in every obstacle and try to learn from everything. Above all, keep moving forward. I am working on book five of the Celia Kelly series and the second book to my Jack Sleuth series. 11. If you could market your brand – not just one book, but your overall brand of writing – in one sentence what would it be? My brand is military mystery/suspense. CN Bring writes a great story, one that is well researched. Her books leave one wanting more.